This is our “Tropical Beauty” project. I love this for it’s bright, bold colors. First we practiced drawing parrots—-I’ve included a website address that has an easy lesson on how to draw a parrot. 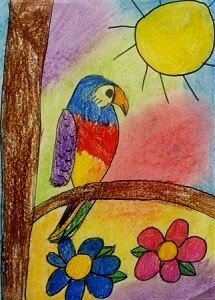 The background is done in colored chalk and the parrot is colored with crayons. Everything was outlined with a black Sharpie. The directions for “Tropical Beauty,” can be found in the 3rd Grade Projects Gallery in the sidebar. This entry was posted in 3rd Grade and tagged 3rd Grade, arts and crafts for kids, classroom parrot craft project, for kids, parrot art, parrot art for kids, parrot art project for children, parrots, tropical beauty. Bookmark the permalink.